Spaces for innovation – There are many factors related to companies which have an impact on staff productivity. Among them, the work environment and its furniture impact on employees’ behavior and may promote aspects related for example to creativity, the generation of new ideas and the collaboration between people. Work spaces are key to motivation, wellbeing and productivity of employees but also to corporate innovation. If we want our company to be innovative we have to design the best place for our people, both employees and collaborators, to work in. Nowadays nobody doubts that innovation is the way to boost growth. Therefore, most companies, and not only major corporations, are incorporating to their headquarters, areas where work dynamics coexist with others more social and human. Agoras, leisure rooms, coffee shops, lounges…encourage solid connections between people and favor know-how exchange. It is here where employees feel comfortable; where they coexist, where different talents flow and where innovation ecosystems are created. Innovative spaces isolated and/or disseminated throughout the office are essential for innovation as they draw the line with the rest of daily activities and promote a more efficient innovation by people. So much so that as declared by Ángel Alba, at present there is no single company without its “innovation room”, “innovation lab”, “innovation coffee”…. “Examples such as Google and its entrance sledges or creativity companies with lively colors and walls full of post-its inspire more than one director to say “Me too”. Companies need to create a physical space for the creation and exchange of innovative ideas; a work environment used for the creative process boosting collaboration and providing an environment for creativity and innovation, many times spontaneous and always safe. In this sense, Alba recalls a study of Harvard’s professor Amy Edmonson concluding that in psychologically safe environments, people believe that if they make a mistake they will neither be punished nor give rise to negative opinions. “They also believe that others will not be affected by or punished for asking for help, information or feedback”. Spaces for innovation provided in offices offer the possibility of “turning a casual conversation into a productive conversation for creation”. Attending different innovation models, we may identify different types of work spaces to work in a collaborative manner and develop a project for example. The work team of a project requires a space to work in a common objective of constant exchange. One feature of these spaces has to be the existence of visible spaces to explain the work in progress not only to the team of the project, as scrum, but also to the rest of the organization. 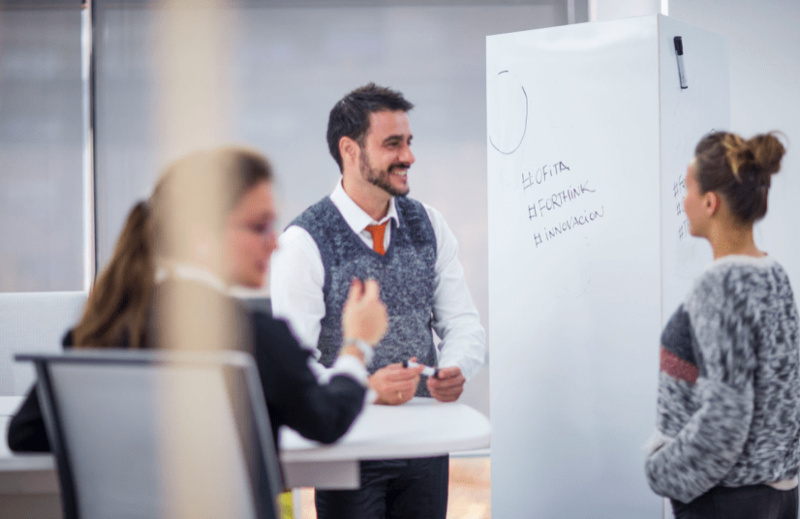 Ofita has introduced a new concept in its work environments: Innovation spaces. These spaces are transversal for all areas of the company and disseminate throughout the office. To date, the design of offices did not follow hierarchy criteria and afterwards, in the last years, it has followed the perspective of moments (meeting, concentration, relax moments…). However, new working methods and specially innovation processes and agile methodologies require new work environments; spaces to ease visual work; meeting areas to share what has been learnt; spaces to work in group and share in an agile manner; flexible and dynamic spaces allowing the design of the space depending on the need of the group…Companies require different spaces for generation, validation and implementation of ideas. 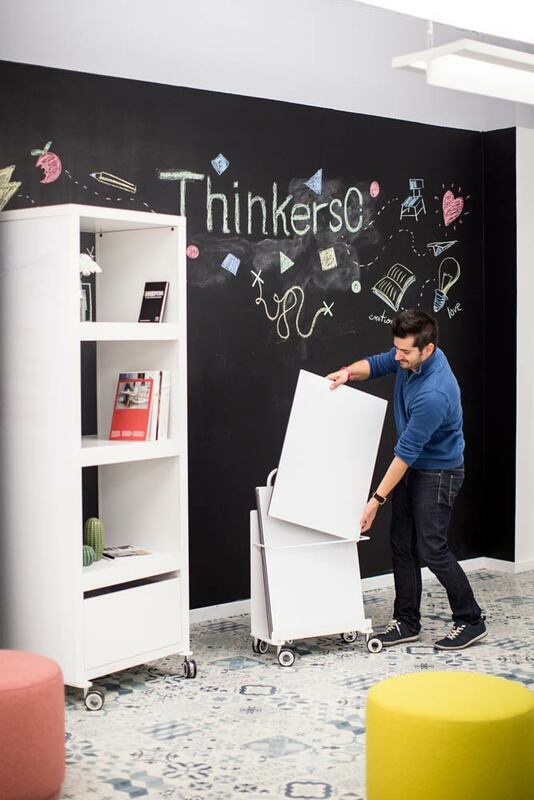 In this context, Ofita and Thinkers&Co have created FORTHINK, a new type of furniture to favor innovation processes and agile methodologies of each company and/or team. Forthink helps teams to work in a more visual, cooperative and collaborative manner. It is a range of furniture and mobile accessories to work in motion. The system of white boards and supports with magnetic and writable surfaces encourages creativity and the generation of ideas. They are magnetic sheets with a covering to write and erase. These panels help us work more visually speeding up learning and making work sessions more collaborative. Forthink turns walls into a work space. Special painting of walls allows the fixing of magnetic panels. Users can write and erase as many times as they want. A mobile device to write and erase, it also has a metallic structure to easily place magnetic panels. They are ideal both for efficient meetings and to work dynamically with several people and challenges at the same time. These wheeled modular pieces help us create spaces easily and efficiently. Its metallic structure helps us place magnetic panels to work on them. Their main function is to create work spaces for the dissemination of knowledge and to motivate attendants to team dynamics. These mobile stands act as team revitalizer as well as designers of new spaces. A container that stores the stuff of users.